Reflexology has been practiced as an art and science for over 5,000 years. The tradition dates back to ancient China, India and Egypt, where it evolved as an integral component of mainstream health care. The simple theory of reflexology is based on enhancing energy flow through all parts of the body by using a specific form of pressurized touch on the feet. The intention is to activate the flow of energy through more than 7,000 nerve endings on the sole of the foot, through various pressing, pulsing, holding and kneading actions. Its most basic function is to stimulate the body’s own natural relaxation response. When there is stagnation of the vital life force in the body, it is felt as pain, stiffness, or weakness. When there is free flow of vital life force in the body, it is felt as pleasure, agility and strength. Reflexology does not diagnose or prescribe for illness; it aims to induce a sense of calm within the mind-body and promote an overall feeling of well-being. We love to tell our guests that removing their shoes and socks is the last bit of work they have to do. 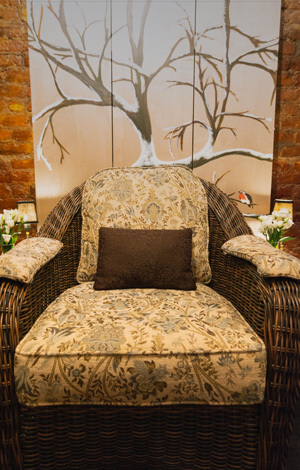 You’ll sit in one of our cozy chairs, we’ll wrap you in a fluffy blanket, and soak your feet in a warm bath. You don’t have to move or flip over. You don’t have to apologize for not shaving your legs or for being ticklish. And please tell us if you prefer deep or light pressure. Allow yourself to simply experience release and renewal. A refreshing peppermint spritz and hot towel will gently bring you back to the awareness of time and space. Feeling relaxed in your body and mind is natural. And we help you to remember.